These days it is becoming more and more difficult to manage ever shrinking budgets in the work place. This as true for marketing departments as it is with other corporate departments. Which ia why it is important to look for inexpensive products to incorporate in you promotional products inventory. One such product is lanyards. Lanyards are a great way of getting your brand out to a wider audience, and are a versatile product to use in your business. From events and functions through to everyday staff use, a lanyard can market your business to an audience you may not typically reach through your normal marketing. 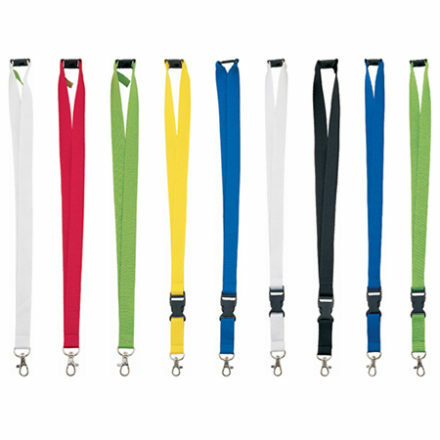 There are three main uses for lanyard – events & functions, sporting events and general office use. For events and functions you need a custom lanyard that looks good and gets your brand across while still looking professional. There are a number of lanyards which are suitable in particular our silk lanyard. It is perfect for giving that little bit extra class and adding value to a product with very little additional cost. For sporting events you would probably want to consider something comfortable and something that will get your brand across. Our sublimation lanyards are perfect as they allow for a bright and bold print with a photo quality finish. Also the polyester lanyards are a great choice for an all-round promotional lanyard that looks good and is comfortable to wear. For general office use your first choice should be something comfortable to wear as your staff members are likely to have it on them at all times. Again, our Satin Lanyards are perfect for day to day use and will bring a touch of professionalism. They allow for a great logo print, and will bring attention to your brand. Lanyards are a great promotional tool and often get used over and over again bringing your brand more marketing opportunities. If you need a promotional lanyard for your next event or function you should consider one of the many options we have available.